This unit is the basis of the Dwarven infantry with their excellent strength, slow cross-country speed and a skill to fight in a hilly terrain. In the battlefield, a unit of Dwarfs is able to become a rock, and they cannot be harmed. Dwarves are creatures born for labor and war. 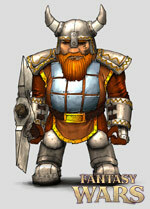 Sturdy, strong and accustomed for long exhausting work in mines, Dwarves are capable of withstanding any battle. Their hammers flatten metal on smithy and enemy helmets on the battlefield with the same easiness. No armor will bear a strike of a Dwarf accustomed to make tunnels in hard rocks.